Used to record that a type was spelled with a bare identifier rather than as a template-id; the equivalent for non-templated classes is just RecordType. 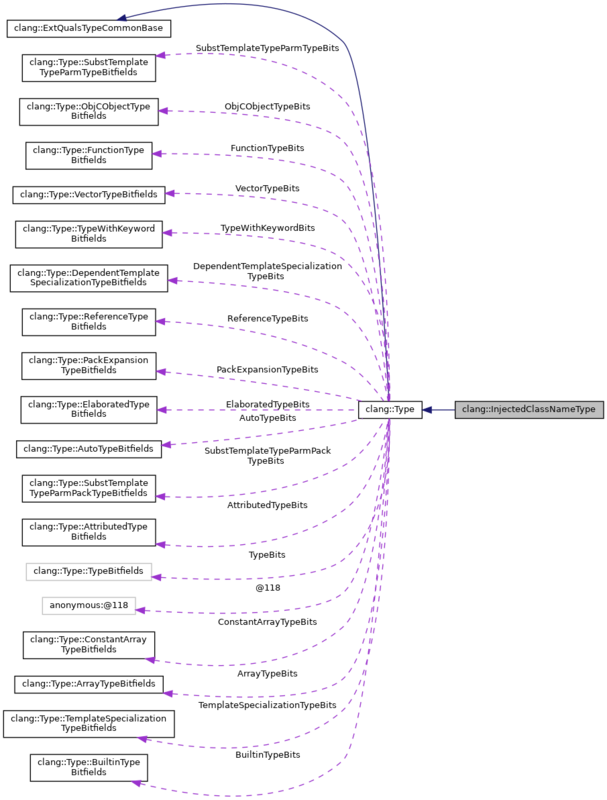 Injected class name types are always dependent. Template instantiation turns these into RecordTypes. Injected class name types are always canonical. 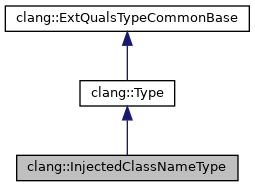 This works because it is impossible to compare an injected class name type with the corresponding non-injected template type, for the same reason that it is impossible to directly compare template parameters from different dependent contexts: injected class name types can only occur within the scope of a particular templated declaration, and within that scope every template specialization will canonicalize to the injected class name (when appropriate according to the rules of the language). Definition at line 4990 of file Type.h. Definition at line 5037 of file Type.h. Definition at line 5035 of file Type.h. Definition at line 3334 of file Type.cpp. Referenced by clang::TreeTransform< Derived >::TransformExceptionSpec(), clang::TextNodeDumper::VisitInjectedClassNameType(), clang::ASTNodeImporter::VisitInjectedClassNameType(), and clang::ASTTypeWriter::VisitTagType(). Definition at line 5022 of file Type.h. Referenced by mangleAArch64VectorBase(), clang::ASTNodeImporter::VisitInjectedClassNameType(), and clang::ASTTypeWriter::VisitTagType(). Definition at line 5024 of file Type.h. Definition at line 5028 of file Type.h. Definition at line 5034 of file Type.h. Definition at line 4991 of file Type.h. Definition at line 4992 of file Type.h. Definition at line 4993 of file Type.h.